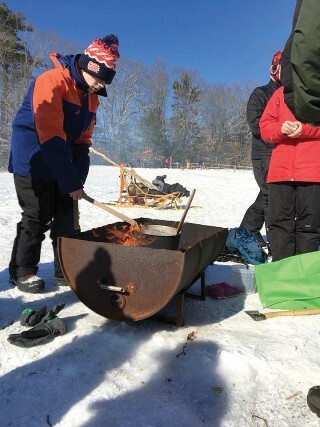 Last Saturday, February 10, Boy Scouts from all over Maine attended the annual Klondike Derby competition at the East Windham Fire Station and Lowell Preserve. Troop 805 from Windham volunteered to host the event after the previous organizers stepped back. The troop volunteered on a suggestion from Senior Patrol Leader Jacob Piechowski. Scoutmaster Paul Preston agreed and it was decided that they would use a Star Wars-like theme. 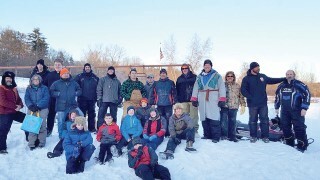 This year’s theme was Klondike Derby – A Hoth-style adventure. Stations were set up around the preserve with activities that challenged the boy’s Scouting skills. The boys dragged a sled, based on the dog sled concept, around the course to each station. without hurting the figure and an obstacle course event challenged the boys with many skills including knot tying. Teams were given points for the various skills they demonstrated. Winners were: overall was Scarborough Troop 47, with second place by North Yarmouth Troop 92 and third went to Westbrook Troop 83. In the AT-AT building competition, Troop 30 from Cape Elizabeth took first place. The fastest Rebel Training Camp time was Scarborough Troop 47 and the fastest Kessel run was Troop 621 from Bath. For more information on how to get involved with Boy Scouting, visit www.PineTreeCouncil.org.